A writer friend of mine finished NaNoWriMo yesterday, one day early. 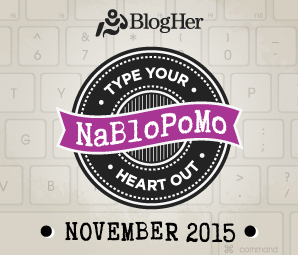 In case you don’t know or remember, NaNoWriMo is the older sister of NaBloPoMo. The intention is daily writing of between 1,500-2,000 words during the month of November, with a goal of 50,000 words – the first draft of a novel. This has always seemed like an extraordinary effort. Don’t know if I’ll ever attempt it. But my friend completed her draft of 52,000 words one day early. And, to quote her, “now the massive rewrite”. As I write my final post of the month, I am struck by the fact that completion is always followed by a beginning. I know that for me, facing the ‘next step’ has sometimes been daunting, even discouraging. So, although it may seem obvious, this insight is actually a small thunderclap. Now, with this post, I am completing NaBloPoMo 2015. As has happened each year previous to this, I am of two ‘minds’. That’s the expression, but not exactly what I mean. Oh well. There is one part of me that is relieved to have completed this self-appointed challenge. And another part that wonders if I want to continue with blogging on some regular schedule, or just remain dormant until November 2016? I will reduce my expression further. This entry was posted in Creativity, Writing and tagged NaBloPoMo 2015, writing by Assembling a Cooking Life. Bookmark the permalink. Congrats. Another year! amazing. Impressive. Wow! An exciting part is: we”ll just have to wait and see what comes next! !